Hydrogen has been gaining favor as a suitable alternative to foreign oil as an energy source. Because of the many methods by which it can be produced domestically, including corn and switch grass derivatives, there has been an increasing interest in developing products that utilize hydrogen as the primary energy source. In the short term, coal, another domestic though non-renewable resource, can also be used to produce hydrogen, thereby reducing the immediate pressure to import overseas petroleum. Hydrogen’s high mass-specific lower-heating valued-based energy density of 120 MJ/kg makes it favorable for many applications, and it is a potential alternative to the current oil-based energy production methods in the stationary power and automotive sectors. Historically, hydrogen has been used in several common industrial processes, as well. Hydrogen’s primary industrial uses have been in ammonia production and oil refining. Ammonia, which consumes half of the globally-produced hydrogen, is produced by reacting atmospheric nitrogen with hydrogen. It is used in fertilizer manufacturing, industrial refrigeration and industrial chemical manufacturing. Ammonia is also used in cleaning and sanitizing applications. Hydrogen is also used in the oil refining process, an application which accounts for about 35% of the global hydrogen consumption. It is used to upgrade viscous oil constituents to produce gasoline and diesel fuel, and also aids in sulfur removal. Reformed hydrogen is also used to reduce other atmospheric pollutants, such as nitric oxides (NOx) and other hydrocarbon fuel emissions. Sulfur and other emissions constituents are targets of continued fuel standards tightening in the US and Europe. Both sulfur and NOx are key contributors to acid rain, which is extremely detrimental to the regional climate. Increased focus in sulfur and NOx reduction has increased the demand for hydrogen production. Other uses for hydrogen which drive demand for production include metallurgy, chemicals and pharmaceuticals, glass and ceramics, food and beverages and electronics. A well-known technology for converting the hydrogen into electrical energy is the fuel cell. 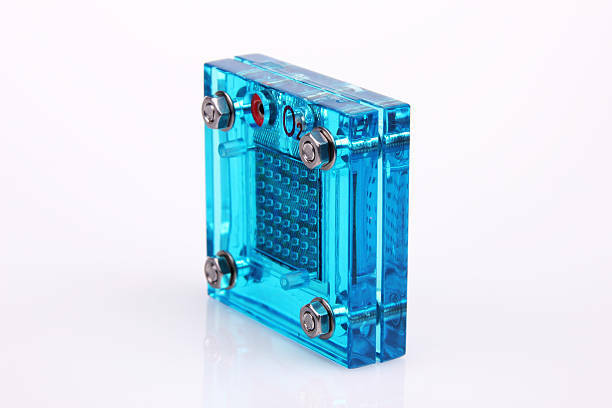 Fuel cells were highly researched in the mid-2000s due to their zero-emission stack reaction, whereby hydrogen is reacted with oxygen in the presence of an electrolyte to produce electricity with pure water as the reaction byproduct. Because fuel cells convert the chemical energy provided by a fuel directly into electrical energy, they can be about twice as efficient as conventional technologies that rely on a combustion step to convert the chemical energy into thermal energy before the subsequent conversion step to electrical energy, losing about 70% of their initial energy content as heat. Fuel cells are up to 60% efficient in energy conversion (with the remaining 40% lost as heat), and combined heat and power systems can attain energy conversions of up to 90%. A 2016 Fuel Cell Market report suggests that the market size stationary power generation market in both small scale ~1 kW residential combined heat and power use and large-scale ~100 kW distributed power generation use has the potential to reach $2.4B and $16.8B, respectively. The largest market sector is the automotive market, which has potential revenues of up to $252B. Currently, there are various market players developing fuel cells, mainly for stationary applications – Bloom Energy, Ceres Power, Plug Power, and FuelCell Energy to name a few. The vehicular market is increasing slightly due to the pull from electric vehicles, expediting development of electric drivetrains. These become another “customer” of fuel cells, creating further demand for hydrogen. The key challenges to wide-scale implementation remain first-cost due to high temperature operation (expensive materials), and how to cost-effectively make the hydrogen. Steam methane reforming is among the favored reaction paths to produce the very energy-dense fuel. Though faced with technical and commercial challenges, fuel cells remain critical in unlocking the hydrogen economy for the wide market of energy consumers.